In the early nineteen twenties, small boatyards dotted the shores of the Kieler Bucht (Bay of Kiel). The cousin of George Dibbern’s wife Elisabeth, Günther Niemeyer (a younger brother of George’s childhood best friend Hans), was drawn into boat building and passed his master boat builder exam in September 1922. He had already established a reputation as a boat designer and boat builder, winning praise for the ease of handling and the seaworthiness of his yachts. His motto was Simplicitas sigillum veritatis, “Simplicity is the sail of truth.” He was interested in the aesthetics as well as the technology of boat building and produced a thesis setting out aesthetic norms for yacht building. It was in the Tetsche Müller boatyard in Mönkeberg, a little town adjacent to the Niemeyer estate in Heikendorf on the Kieler Bucht, that George first saw the hull of what would become Te Rapunga. In October 1923, Günter Niemeyer completed the design for the 10 metre (31 ft. 11 in.) 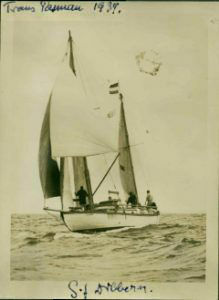 Baltic double-ender with the lines of a Norwegian pilot cutter, with a beam of 3.32 metres (~ 11 ft.), a draught of 1.5 metres (~5 ft.). Tonnage was listed as 7 tons. Constructed out of 2.8 centimetre (1 1/8 in.) oak planking, she was originally rigged as a sloop, but has spent most of her life with a ketch rig which Dibbern found suited her better. While he often referred to her as his “cradle” and his “fatty” he did so with affection and admiration for her sailing performance. “Niemeyer had an eye and hand for designing; there was no doubt about that,” he wrote in Quest, describing how he was moved to invest in Günter’s boat building business. Unfortunately, there were not enough sailors who could afford the luxury of a yacht in those post war years and the enterprise failed. All that George got out of his partnership was the hull that Günter uncannily had insisted all along was destined to be his. Te Rapunga is currently undergoing restoration in Tasmania, Australia.